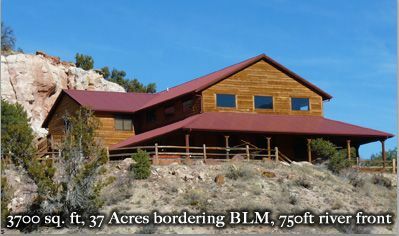 6 bedrooms, 4 bathrooms, Sleeps 16 in beds. Welcome to the Royal Gorge River Ranch. Luxury accommodations on the river banks of the Arkansas River, America's most popular white water rafting destination! Just one hour from Ski Monarch! Enjoy a relaxing stay with us at the Royal Gorge River Ranch. A stay with us also includes access to world famous white water rafting trips with Colorado's finest rafting outfitter in our region - Royal Gorge Rafting & our top rated tour with Royal Gorge Zip Line Tours. There are many activities to choose in our region which makes it easy to spend multiple days immersed in adventure as well as finding time to relax. Raft, Zip, hike, bike, ATV, fishing, hunting, skiing, snowboarding or just relaxing and enjoying in the Colorado way of life. If we're booked. Call we can still help out! : We offer the most affordable luxury accommodations in the Canon City, Colorado / Colorado Springs region at the very best value. Staying at a hotel, motel, campground or bed and breakfast is fine but none offer the location or relaxing atmosphere found at the Royal Gorge River Ranch. Consider the benefits of staying away from the 'hustle and bustle' and enjoying a relaxing vacation instead. Amazing wrap around deck with views overlooking the Arkansas River. We spent 4 days here with my husband's parents, his 5 siblings and our families. The house is kept up very well and we had everything we could possibly need. My ONLY complaint is that it isn't very sound proof. The doors to the bedrooms don't seem to fit snugly, and the doors on the bathrooms are pocket doors which also don't fit extremely snugly. So, since the bathrooms are shared between rooms, we could hear pretty much everything going on in the bathroom, and often, what was happening in the adjoining bedroom. There is also a living area outside the upstairs bedrooms, and if the kids were watching TV there or talking, we could hear pretty much everything loud and clear, even with our bedroom door shut. Otherwise, we loved the house! Very nice outdoor areas and great porches! Thank you for your review! We're so glad that you had a great stay with us! We appreciate your feedback as it is invaluable to us to not only better our services but to progress in our ability to create a better experience for our guests. We hope you will come back and visit us again soon! Love the location and the property. Amazing , beautiful home with everything you need. Great location and nice people. Great location, took advantage of RG rafting and zipping discount having rented the property. 1000s of stars while in the hot tub at night and we enjoyed the fire pit several nights. Nice porch with a lot of seating outside to enjoy the scenery. Really nice kitchen and plenty of dining space for 16 people inside. Beds were all very comfortable, baths were perfect for our 3 families. Very close to Royal Gorge. All of the people we interfaced with at check-in, restaurant, rafting and zip lining were very friendly. I have to share the not so good from my perspective. The ice maker didn't work and we were offered to get ice from the restaurant at any time, which we did. There is no closet or dresser in the master bedroom. We used the bunk beds in the room adjacent to the master bath to lay our clothes on. On the VRBO site it list ping pong, foosball and a walkway to the water. There are none of those. The walkway to the river is gated off. The VRBO site says: enjoy the Arkansas River all from our private beach which is literally right outside your door! You can see it, but to access the beach you drive across Highway 50. It's a great place to stay, I say these things just to let you know how it really is. We will update our listing as the foosball table has been destroyed along with the ping pong and the river does have a gate to discourage people from crossing the tracks. Although we do have another beach caddy corner from the house which has a beautiful sandy beach and is accessible. We are glad you enjoyed your time with us! 1hr from Colorado Springs, 2 hrs from Denver, World Class rafting out your front door! 1hr to Skiing! Golf: Four Mile Ranch Golf Club was originally a 1640 acre working cattle ranch in Cañon City, Colorado. The property has been transformed into a development where a new breed of settlers can stake their claim. Award winning architect, Jim Engh shaped this land into a 7,053 yard masterpiece for golfers to enjoy. Four Mile Ranch Golf Club opened up for play in 2008 so come on out to the ranch! Ski: Ski Monarch! Only 1 hour away. We can provide ski shuttles! ***OUR CANCELLATION POLICIES ARE DIFFERENT THAN WHAT HOME AWAY OFFERS. FULL PAYMENT WITHIN 30 DAYS OF CHECK IN. NO CANCELLATIONS OR REFUNDS WITHIN 30 DAYS UNLESS COVERED BY A NEW RESERVATION. Rates are subject to change until reservation is confirmed.